Episode two of Minecraft Story Mode is a shorter, but more action packed episode than the first of the new season. We have new characters to get attached to and the enemy we were introduced to appears to be sticking with us, albeit in an entirely new form. The first episode of the new season got off to a slow start with the beginning dragging on a bit reintroducing us to characters and setting a confused scene. Thankfully, the episode sped up and the ending promised that things would really get going in episode two and I am pleased to say that they do. The episode starts immediately where the first one ended with the gigantic prismarine colossus known as “The Admin” threatening Beacontown. Jesse must once again act quickly to save his friends and the townspeople from destruction. The sequence is heavily QTE focused and unlike the first episode where some of the events had a very short window, this time they are very generous with it being near impossible to induce a fail state. Once the colossus has been vanquished a new enemy appears, this time in the form of a snowman. It turns out that it is still the Admin and now he has used his powers of control over the world to plunge Beacontown and the surrounding area into a state of eternal night with all the dangers that darkness brings in the world of Minecraft. I very much like this idea of the enemy being a server admin, as a conceit it amuses me greatly to see him use a clock to set time to night, and introduce new parameters for our band of heroes to overcome. In this particular episode, Jesse and friends are tasked with recovering the clock from the Admin’s Ice Palace, an imposing structure filled with games and traps to complete. He sets a task for Jesse to be the “winner” and to recover the clock first. By doing so he will partner with him and together they will be all powerful. I talked briefly about the introduction of the new character Jack from the first episode, and I’m pleased to see that he is back in this episode. He is very well written with some amusing dialogue, and he is joined in this episode by the Admin with some very amusing one liners. 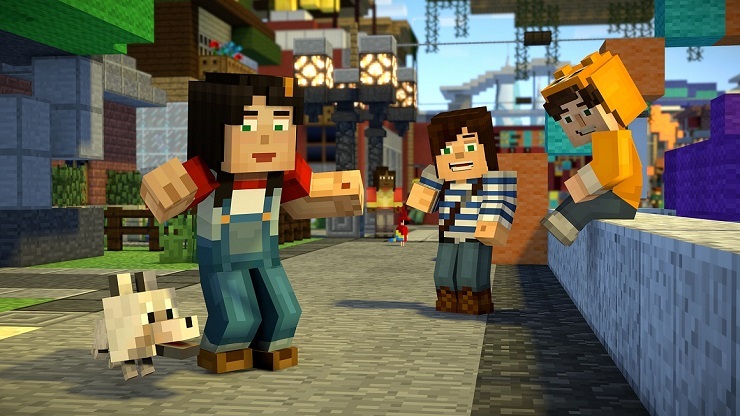 The introduction of these new characters brings me again to wonder why the early stages of Minecraft Story Mode went to such lengths to introduce Axl and Olivia to us to then completely disregard them for new characters early on in the first season. One can only assume there were issues with the obtaining time with the actors who voice the characters, but it seems odd that they have been cast off – a point that the writers attempt to address in this episode with a touching moment filled with existential crisis between Petra and Jesse. The events in Giant Consequences are a lot of fun and I particularly like that in this episode and with the new season so far there is a lot more emphasis on crafting and elements that make up the source material. The opportunity to rebuild Reuben’s memorial statue in any way that you saw fit with the limited materials supplied to you was a nice touch. The pacing of Giant Consequences is significantly improved on the previous episode with the story whipping along at a good pace. There are still moments where the characters are just filling for time, but I can start to see a thread emerging between Petra and Jesse that is interesting, and the theme of friendship and all that entails is taking shape. 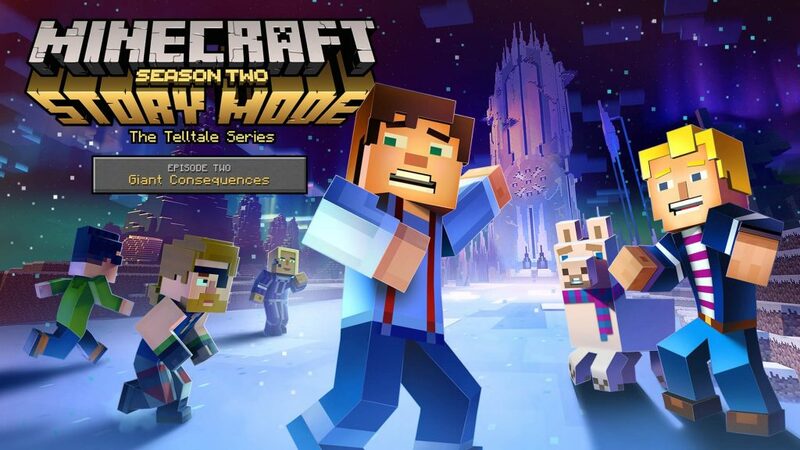 There are a few cool action sequences that will delight younger players as well; a fight with huge hybrid snow iron golems being a particular highlight which itself followed a really fun fairground shooting range scene. Giant Consequences is a better episode than A Hero in Residence, moving along at a greater pace and with more purpose than the more meandering narrative of the first episode. The new Admin baddie is amusing and I look forward to seeing what other Machiavellian antics he has for our friends to tackle in the next episode.